I got this one from my bro (thanks bro) as I happened to have it on my Steam wishlist since it sounded like an interesting narrative-driven indie game. I also liked the fact the ad blurb mentioned the word "choice" a couple of times too. Yeah. Anyway, after 2 hours I managed to finish The Novelist and here is its review! It's never clear what exactly you are in this game but perhaps the best way to describe it is that you're a benevolent (or not so benevolent I guess, depending on your choices) spirit. The Kaplan family, Dan, Linda and Tommy, move into this haunted house for the summer all with issues they're hoping to resolve. 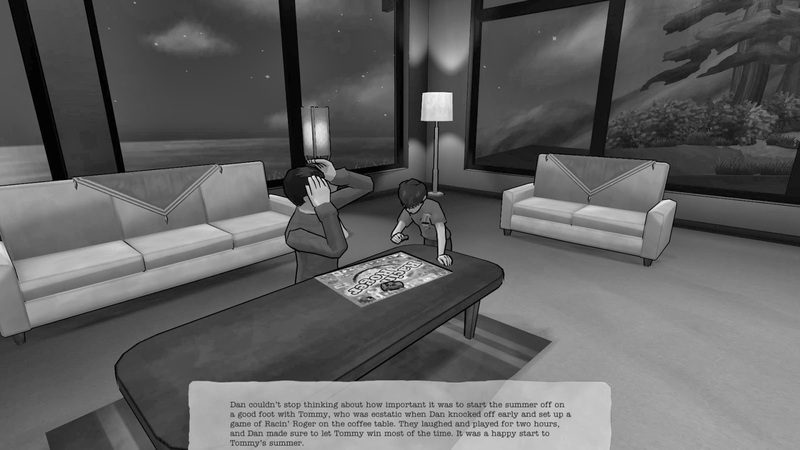 Dan is a novelist (hence the game's name) which hasn't released a best-selling book in a long time, Linda is afraid her marriage is falling apart and wants to get reacquainted with her passion of painting, and little Tommy is having trouble learning at school and obviously craves attention from his parents. It's basically a story about life, how there's so little time to do the things you want to do and in the end there are going to be winners and losers. Like several other games I've reviewed recently such as Thirty Flights of Loving, Dear Esther and Gone Home, the Novelist could almost be classified as a "non-game". The best way to describe it is that it's a visual-novel with some stealth action elements. Ultimately, all you're doing is choosing who in the family requires the most attention to their needs and the story changes as a result. However, in order to get to that point you'll spend some time sneaking around the house in your spirit form gathering clues. The Kaplans are able to see you in the open and if they do, you won't be able to pick a "compromise" for that character (i.e. a consolation prize when it comes to giving attention to that character's needs). So to remain unseen, you hide in lights. You can also cause the lights to flicker if you want to distract the Kaplans from a clue you wish to read. If that's not enough, you're also able to enter the memories of the characters to gain additional clues. Once you've discovered all the clues you can make a choice for that chapter on whose needs will be met. Sneaking around provides a slight challenge but it seems rather out of place for the kind of game it is - like it was tacked on for the sake of keeping the player awake (a bit like how some games add QTEs during cutscenes). Thankfully, there is an option to turn off the need to sneak about (Story Mode I believe) if you don't like it. Addition of a stealth component is probably not entirely surprising though considering Kent Hudson was involved in making games like Deus Ex: Invisible War. 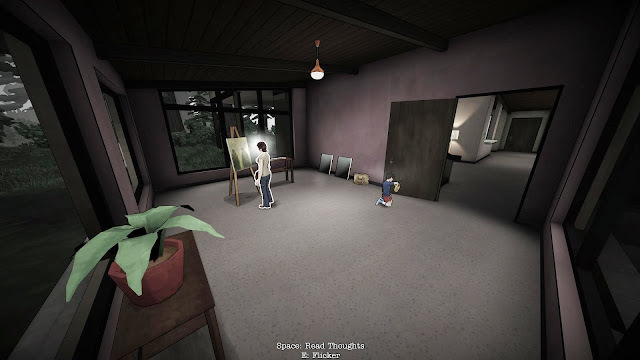 Sound effects are minimal and the game mainly consists of voice acting besides the sounds of the Kaplan family moving about the house, which are important audio cues when you are sneaking around. Minimal soundtrack. What's there is good but there probably could've been a more diverse selection of music, especially considering how creepy it sounds at times. Graphics are okay and consist of cel-shaded characters for the Kaplan family and the house. No issues with framerate drops or any major glitches. Since this game seemingly offers multiple outcomes like a visual novel (I haven't tested it but I'm pretty sure that's the whole point to this) I'm actually slightly tempted to replay the game to see if my choices could potentially cause tragic results or even better ones (obviously "better" is subjective in this context). I think the ending I achieved struck some sort of compromise. I didn’t notice any serious bugs while playing which is refreshing to see nowadays. A great plot that any father and husband can relate to - it's good to see a game that explores mundane but real-life problems. This can be its Achilles Heel though since it might hit a bit close to home. It's definitely not a game for those who value escapism in their gaming or for those seeking some action.